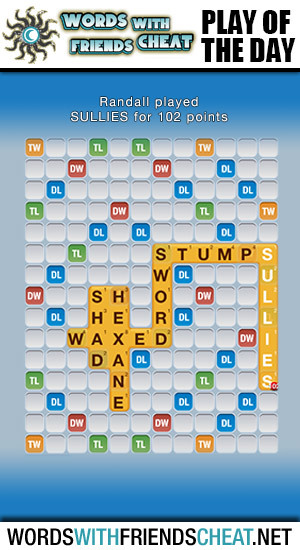 Today’s Words With Friends – Play Of The Day is SULLIES (102pts) and was submitted by Words With Friends Cheat user Randall. Randall racked up 102 points in a single play by emptying his entire rack on the edge of the board. He incorporated the triple letter and double word tiles in order to achieve this great score. verb (used with object), sullied, sullying. 2. to mar the purity or luster of; defile: to sully a reputation. verb (used without object), sullied, sullying. 3. to become sullied, soiled, or tarnished.